Gansu (gān sù 甘肃) is a province of the People's Republic of China, locatedin the northwest of the country. It is bordered by Mongolia (méng gǔ 蒙古), the autonomous regions of Xinjiang (xīn jiāng 新疆), Inner Mongolia (nèi méng gǔ 内蒙古), Ningxia (níng xià 宁夏), and the provinces of Shaanxi (shǎn xī 陕西), Sichuan (sì chuān 四川), and Qinghai (qīng hǎi 青海).It has an area of 141,500 square miles (366,500 square kilometers). The capital city is Lanzhou. Gansu has a multinational population which includes ethnic minority groups of Kazak (méng gǔ zú 哈萨克族), Mongolian (méng gǔ zú 蒙古族), Tibetan (zàng zú 藏族), Hui (huí zú 回族), Dongxiang (dōng xiāng zú 东乡族), Tu (tǔ jiā zú 土家族) and Manchu (mǎn zú 满族). 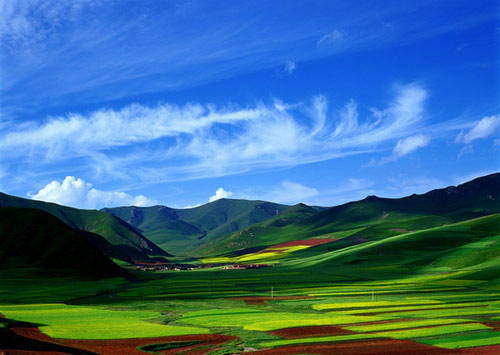 Gansu is both blessed and cursed by nature. 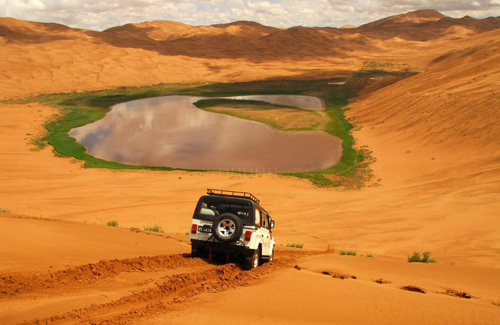 The province has fertile yellow earth that the Yellow River runs through, but the boundless Gobi desert also expands across other parts of the region. 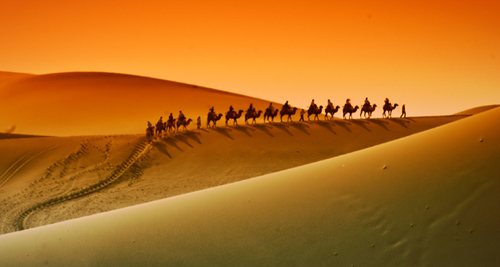 All in all, Gansu is a place worth for travel. 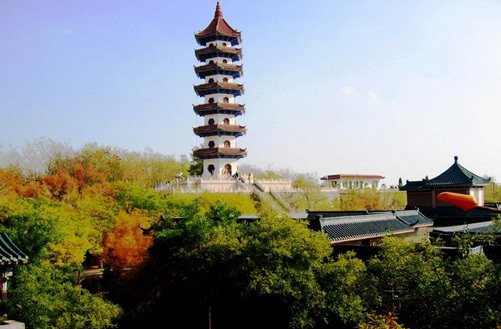 Tulugou State Forest Park (tǔ lǔ gōu guó jiā sēn lín gōng yuán 吐鲁沟国家森林公园) is situated at the hinterland of Liancheng forest area (lián chéng lín qū 连城林区), Yongdeng County (yǒng dēng xiàn 永登县), about 160 kilometers from Lanzhou City (lán zhōu shì 兰州市), and is the eastern branch of Qilian Range (lán zhōu shì 祁连山), with its elevation ranging from 1998 to 3165 meters above sea level. This park features strong stones, exuberant forest and vivid vegetation cover: pasture on the top, forest in the middle and farmland at the foot. Rare animals,birds and plants add more mystery and beauty to this fairy land. Reputed as Mythic Green Valley, The forest has become an ideal destination for eco-tourism. Jinchang (jīn chāng 金昌) is a prefecture-level city in China's Gansu province.The City is located in central Gansu, west of the Yellow River (huáng hé 黄河), north of the Qilian Mountains (qí lián shān 祁连山), and south of the Alashan Plateau (ā lā shàn yòu qí 阿拉善右旗). The southwest of the city borders Qinghai Province (qīng hǎi shěng 青海省) and the northwest borders Inner Mongolia (nèi méng gǔ 内蒙古). It is a newly developed industrial city founded on the basis of mines, nonferrous metal metallurgy and chemical industries. Qingyang (qìngyáng 庆阳) is a prefecture-level city in China's Gansu province (甘肃省). It is habitually called 'Long Dong' (lǒng dōng 陇东) because of its locality in eastern Gansu Province . It borders Shaanxi Province (shǎn xī shěng 陕西省) in the east and north in the neighborhood of Ningxia Hui Autonomous Region (níng xià huí zú zì zhì qū 宁夏回族自治区) in the west. Within the province, it is bounded on the south by Pingliang City (píng liáng 平凉). Baiyin (báiyín 白银) is a prefecture-level city in China's Gansu province. Baiyin City is situated in central Gansu Province (gān sù shěng 甘肃省), the upper reaches of the Yellow River. 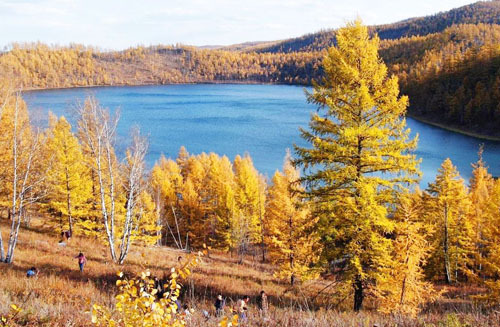 It is bordered by Ningxia Hui Autonomous Region (níng xià huí zú zì zhì qū 宁夏回族自治区) in the east andInner Mongolia (nèi méng gǔ 内蒙古) in the north. The capital city of the province, Lanzhou (lán zhōu 兰州) isadjacent to its west.